Fetoscopy is a procedure where a small instrument (fetoscope) is inserted through a small hole in the skin into the uterus in order to see the fetus and placenta. 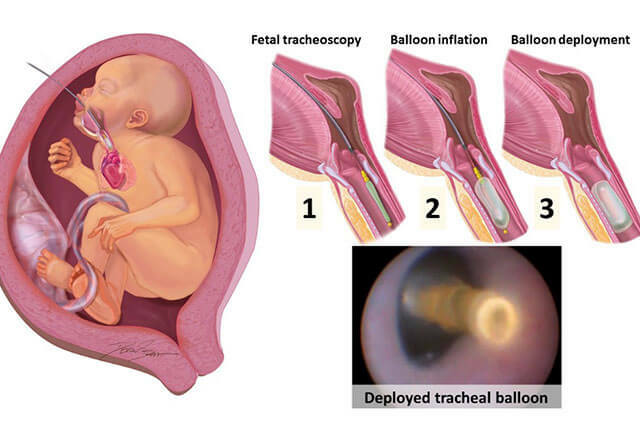 Fetoscopic endotracheal occlusion (FETO) is an experimental procedure to reversibly block the trachea of the fetus with a latex balloon. This procedure is used for fetuses diagnosed with congenital diaphragmatic hernia and impaired lung development. Preliminary research has shown that this temporary tracheal occlusion can improve development of the fetal lung. This may lead to improved survival in babies with congenital diaphragmatic hernia. The Johns Hopkins Center for Fetal Therapy is one of the few centers in the country with physicians trained in FETO and its reversal. We are approved to offer this experimental procedure to patients with severe congenital diaphragmatic hernia (Clinical Trials.Gov Registration Number: NCT 02710968). Our procedures are performed in a state-of-the-art, dedicated intervention suite that allows both parents to be present during the procedure. The procedure starts with an ultrasound examination to find the best insertion site for the fetoscope. After a small skin incision is made at that site, the fetoscope is inserted into the uterus under continuous ultrasound guidance. The fetoscope is then guided into the mouth of the fetus. Once the mouth is entered, key landmarks are followed to guide the fetoscope into the trachea. Once the fetoscope is in the trachea, a small balloon is advanced through a working channel of the scope, inflated with sterile saline and deployed. At the end of the procedure, any excess amniotic fluid is drained through the fetoscope. Following FETO, our patients are regularly evaluated for fetal lung growth and any complications that may require emergent removal of the balloon. We are able to organize accommodation close to The Johns Hopkins Hospital to allow rapid access to care if required. Fetoscopic removal of the balloon is typically scheduled four to five weeks after FETO. Following balloon removal, we plan for vaginal delivery near the due date. Because fetoscopic surgery is minimally invasive, it allows us to plan for vaginal delivery. Similarly, future childbearing is not affected.